B.F.D. Chapter 1: All My Best Friends, by Scotty Gillmer & Carl Thompson. 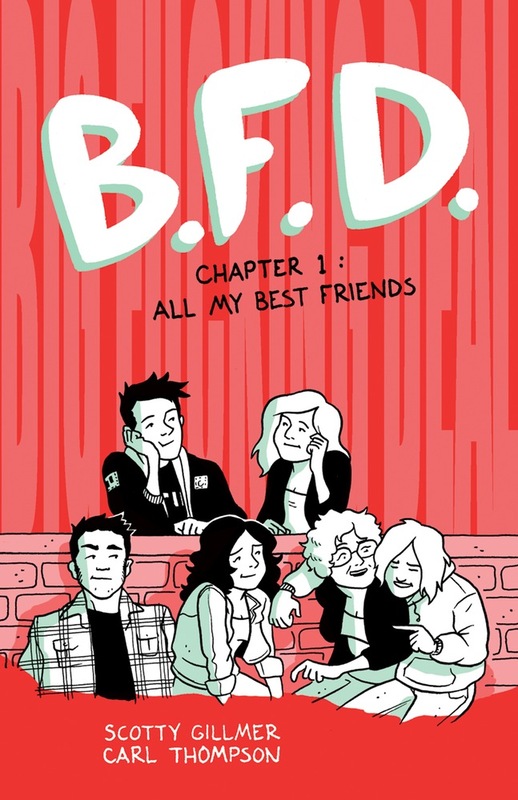 This is a charming and low-key slice-of-life comic about six high school friends and their varied & complicated dynamics. Set in Minnesota (home of the writer and artist), this first issue takes us through a day in the life of the six kids, culminating in a community "leaf burning". There are echoes of films like Dazed and Confused to be found in the verisimilitude of the dialogue and the ways in which teenage emotions tend to be overblown, but the story doesn't overplay its hand in that regard either. A more direct line can be drawn to Jaime Hernandez' work in Love & Rockets. Indeed, there are sequences where Thompson liberally borrows from the Jaime handbook, like when one of the girls balances on a train track as she and her friend have an ambling conversation. The girl, Ava, seems a lot like Maggie, Hernandez' signature character. However, Gillmer & Thompson certainly ring forth in their own voice as well, as the characters feel fully formed and don't fall into the sort of one-note, cliched roles typical in such stories. The first two pages neatly set them up, as each page has three stacked, horizontal panels that wordlessly show each character getting dressed and getting ready for skill. Simply by observing their rooms, their clothes and their body language, the reader is made privy to a great deal of information about them before one of them utters a single word. The issue follows their friendships and tracks one romantic relationship in its incipient stages as well as one about to fall apart. This is just the first chapter of a series that promises to delve into the lives of each of its characters, and I hope each issue is handled with as much restraint as this one was. 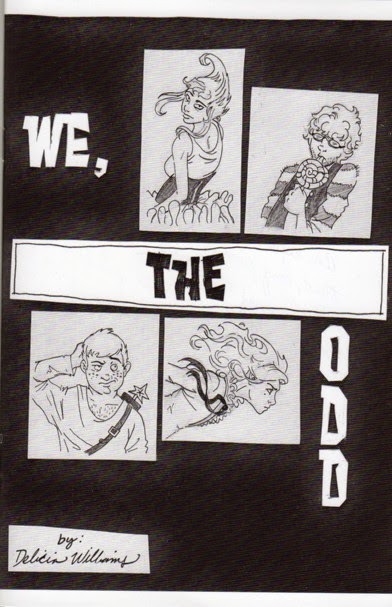 We, The Odd #0, by Delicia Williams. This is essentially an "ash-can" edition of what should prove to be a long, weird and complicated fantasy story. In this issue, we are introduced to a fairy godmother who discovers something is horribly wrong with the infant she's supposed to help out. We meet a woman trekking through a contaminated building who winds up encounter underground cultists, a potentially magic frog, and a man with an envelope for a head wearing bunny slippers. Williams is interested in using familiar tropes in unfamiliar places, but at the moment the story is in its very formative stages. These issues show off her skill with a pencil (there are no inks), especially with regard to figure drawing and body language. Her panel-to-panel transitions are a bit stiff at the moment, but one senses that will get ironed out as she gets deeper into this project. Milo & Sam, by Andy Brown & Joe Ollmann (Conundrum Press). This is a collaboration between Brown, the publisher of Conundrum Books, and his old friend Ollmann, whose books he currently publishes. It's a story about being stay-at-home dads for their toddler boys and a particular adventure in the countryside. It's about the feeling of constant danger befalling one's kids and how that feeling can only get ratcheted up over the course of a day. When Brown & Ollmann give their kids apples and turn the heads for a moment, they are alerted by Milo that "Sam barfing", as he chokes on an apple. 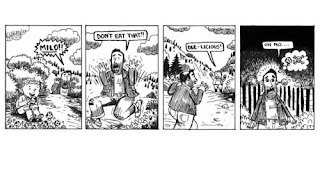 When they turn around, Milo's disappeared into the forest. 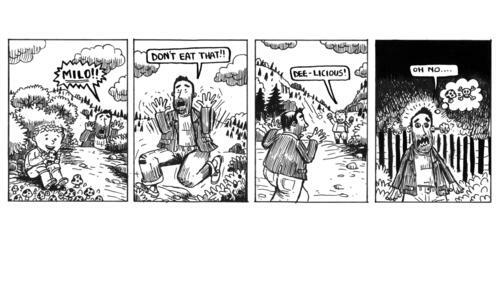 After a frantic search, they see that Milo may have eaten a poisonous mushroom. After a frantic visit to the emergency room (with Milo's mom given a panicked but cryptic phone call), everything turns out to be fine. The comic is given a little more resonance because Milo's mother eventually died of breast cancer, making her appearance here sort of a bittersweet event. The format of the book (it's 3 x 4"), the slightly dressed-down art by Ollmann (it's typically dense but much more spontaneous-looking than his usual work) and it's brevity (52 pages, but each page is one panel) make this a little treasure of a mini. It's a zippy and unsentimental look at fatherhood that still manages to tell its frantic story with a great deal of humor and sweetness.